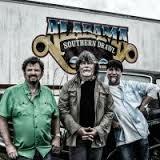 Back in their Eighties heyday, the group put the country rock sound on the map. Over the past three decades, country rock has morphed into flashy stadium shows and a more pop laced sound. And with few exceptions, that’s what we get here. In an effort to attract a new generation of fans while staying relevant to their core demographic, Randy Owens, Teddy Gentry and Jeff Cook put the polish on a generous 13-song collection. Ditto on “Hillbilly Wins The Lotto Money” while “American Farmer” is a patriotic blue collar ode straight out of Toby Keith’s playbook. The traditional country comes out thanks to Allison Krauss’ silky vocals and skillful fiddle on “Come Find Me.” Owen’s distinctive baritone is most evident on the lead single, “Wasn’t Through Loving You Yet.” Elsewhere, his voice seems to get lost inside the band’s skillful harmonies. Taylor Swift said of her transition from country to pop, “If you chase two rabbits, you’ll lose them both.” That’s kind of what happened here.